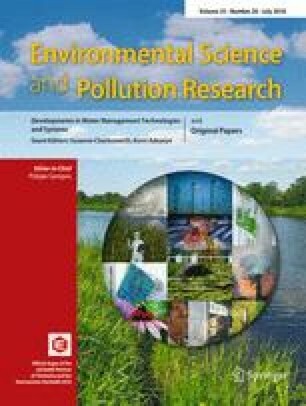 This study probe the probable impacts of coal mining pollution and its impacts on human’s health and environment. A total of 144 samples including coal and coal wastes, soil, plants, foods, and water were collected from the Hancheng county and countryside of Shaanxi, China. All the samples were analyzed for trace elements using ICP-MS, OES, and AFS. Results showed that the concentration of Se, As, Cr, Cu, Pb, Cd, Co, Ni, Mo, U, Th (mgKg−1), Fe, Mn, Al, Ti (%) etc., in coal and coal wastes were 7.5, 12.1, 275, 55, 54.2, 0.8, 14.8, 94.5, 8.9, 4.9, 17.2, 3.5, 0.02, 19, 0.7, respectively. While in soil 0.6, 12, 194, 27.5, 7.4, 0.6, 11.3, 83.4, 0.7, 1.7, 9.9, 3.1, 0.04, 10.5, and 0.4 for the above elements, respectively. In Hancheng foods, the average concentration of Se-0.09, As-0.15, Cr-1.8, Cu-3.2, Pb-0.4, Cd-0.02, Co-0.09, Ni-0.4, Mo-0.64, U-0.01, Th-0.03, Fe-129, Mn-15.6, Al-234, and Ti-5.2 in mgKg−1, respectively, which are comparably higher than the countryside. The elemental concentration in groundwater of both areas was below the WHO-2004 standard. In Hancheng, the average daily intake (mgKg−1bw/d) of Se 0.004–0.0038, As 0.004–0.13, Cr 0.055–0.06, Cd 0.001–0.004, Ni 0.018–13.91, Pb 0.05–0.001 adult-children, respectively. The toxic trace elements such as Cr, Cu, Mn, Pb, Ti, Cd, Co, Th, Fe, Al, and Mo caused non-carcinogenic risk with high morbidity in children than adults. By assessing environmental risks, coal and coal wastes caused high risk, food and plants faced moderate to high risk, while mountain and agriculture soil are prone to low to considerable risk. The pollution in Hancheng County is extreme as compared to the countryside. The study concluded that the contamination is geogenic in both the areas but coal mining enhance the metals contamination and has extensive impacts on the living community and environment of Hancheng areas. The online version of this article ( https://doi.org/10.1007/s11356-018-2148-2) contains supplementary material, which is available to authorized users. The National Basic Research Program of China (Grant No. 2014CB238906), the National Natural Science Foundation of China (Grant Nos. 41172310 and 41472322) and CAS-TWAS Ph.D. fellowship, supported this study. We are grateful to Mr. Gao Bolin and the workers of Liaoyuan Coalmine, Hancheng coal mining Bureau, for their permit and help us to collect the samples in their Coalmine field. The authors are highly grateful to local guileless residents of Hancheng, Shaanxi, for them allow us to go to their homes and farming fields to collect samples of food, drinking water and soil.